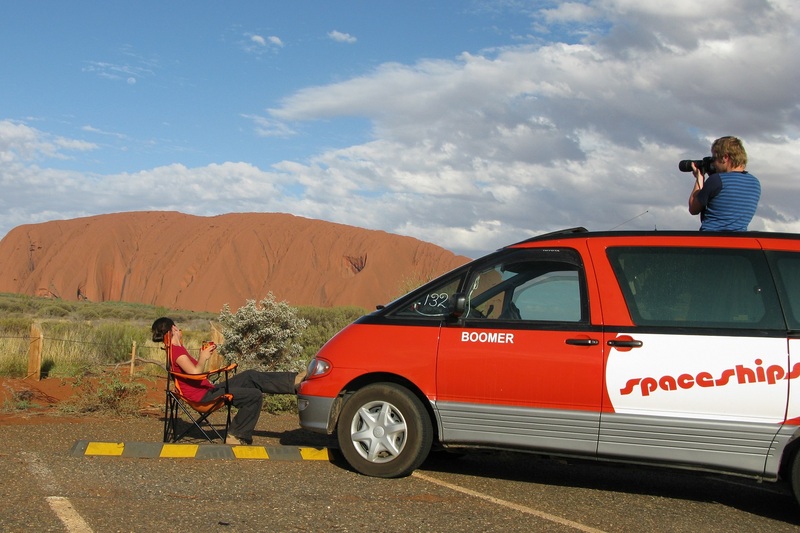 Only Spaceships campervan rentals Australia have two sleeping options allowing you to sleep inside with the back door closed or sleep outside by extending the bed into the rear awning for 30% more space and ventilation. 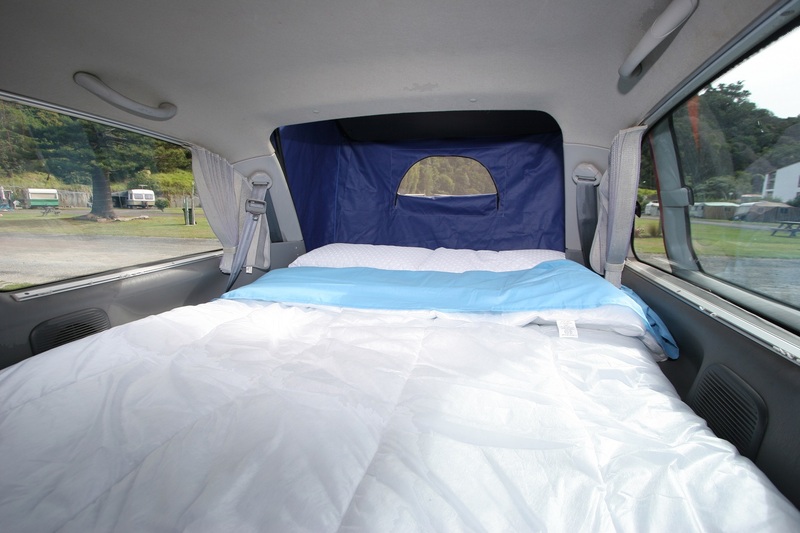 To set up: Simply turn the rear seat around to face the back door, set up the internal bed legs (provided for free) then sit the bed extension and mattress on top. This takes under 10 seconds and is a great option for the winter months. This is a great sleeping option and is unique to Spaceships. It is better suited to the summer months. All you have to do is extend the bed out the back by using the same bed extension as the internal option then fit the rear awning. 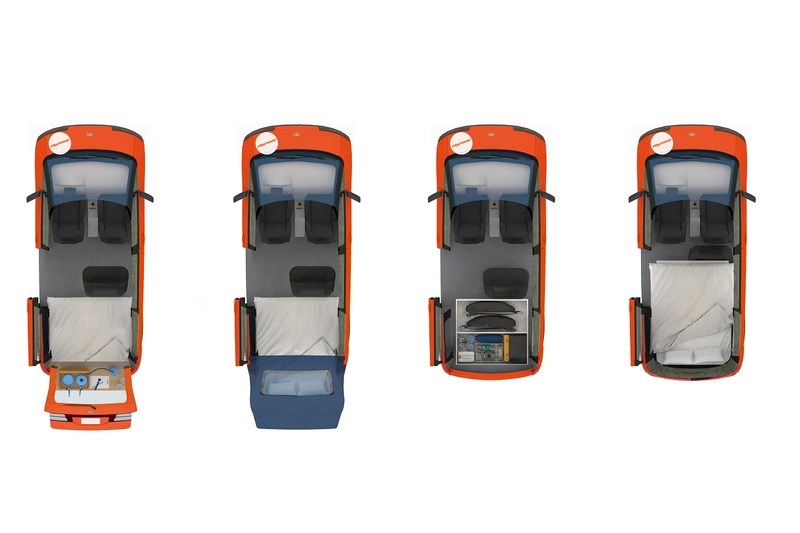 This takes 30 seconds and provides a fully enclosed waterproof sleeping option providing 30% more space and ventilation. A large insect screened window is included which can be zipped up or left down for increased ventilation. A customised cooker stand is provided that sets up in seconds. This provides an external platform to cook from. Alternatively you can set your portable cooker up on picnic tables in campgrounds. 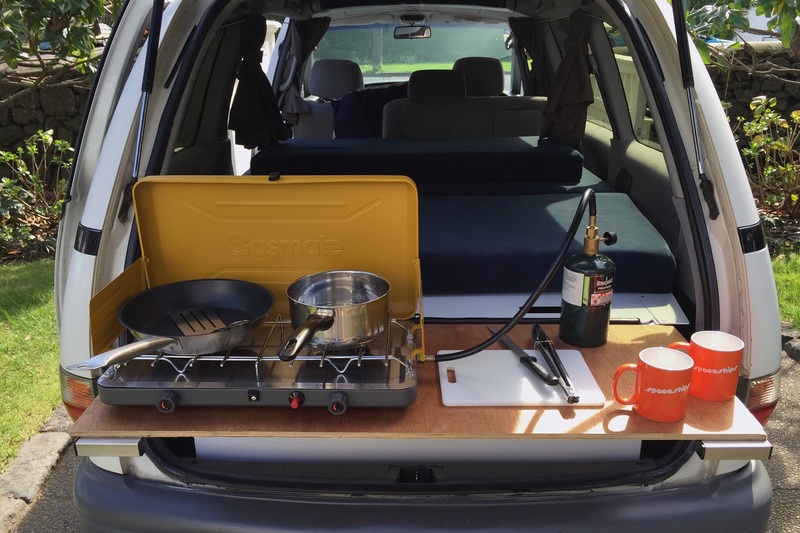 A complete cooking kit is provided along with utensils and a 20 litre water container. All Spaceships are set up with two batteries forming a dual battery system. One battery starts the engine and the second battery powers the accessories. 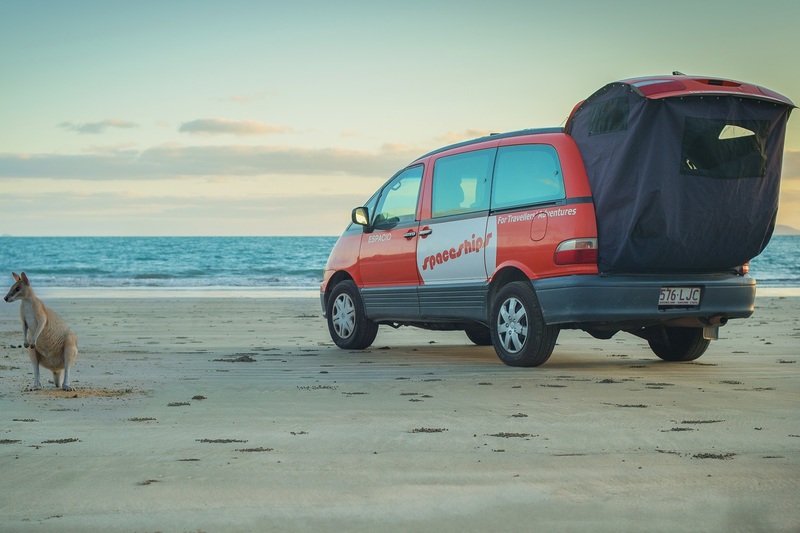 This means you save money as you do not have to pay for powered sites each night like you would in an ordinary campervan or motorhome to charge your vehicle. There is seat-belted seating for four people. The back seat has a tilt adjustment to recline the seat to watch a movie or have a snooze whilst on the road. It is also on a runner in the floor so it can be adjusted depending on the leg-room required. 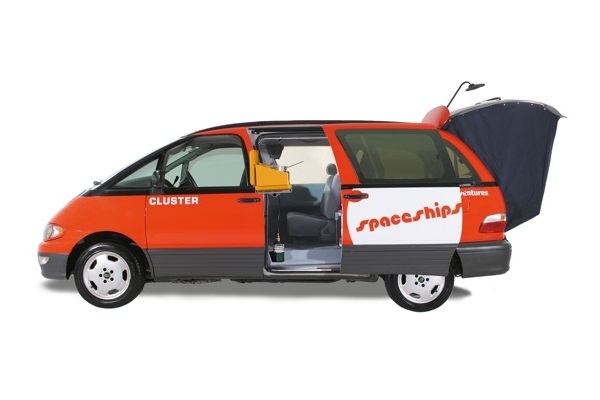 Your Spaceship comes fitted with a quality MP3 player. There is a surround sound system with 4 speakers plus an ipod/Mp3 cord fitted so you can cruise and listen to your favourite music. The main storage is accessed from the back and can securely store two large soft backpacks. We have improved the rear awning by including a large zip down area so you can access the rear storage compartment with the awning still on. The internal storage area is where the cookers, cutlery and cooking equipment are stored and offers space for dry food storage. Once again you do not have to re arrange the interior for day and night time use. A quality fridge/freezer is provided. This unit is highly reliable and will actually keep your food chilled like a normal fridge. 1. Driving mode: The seat can face forward in the driving position and seat one person with a shoulder belt. This enables a child seat or booster seat to be fitted if required. We cannot cater for babies under the age of one. 2. Sleeping mode: You can swivel the seat to face the back door and extend the bed internally for sleeping with the back door shut (bed legs are included for free, and they only take about 10 seconds to set up). 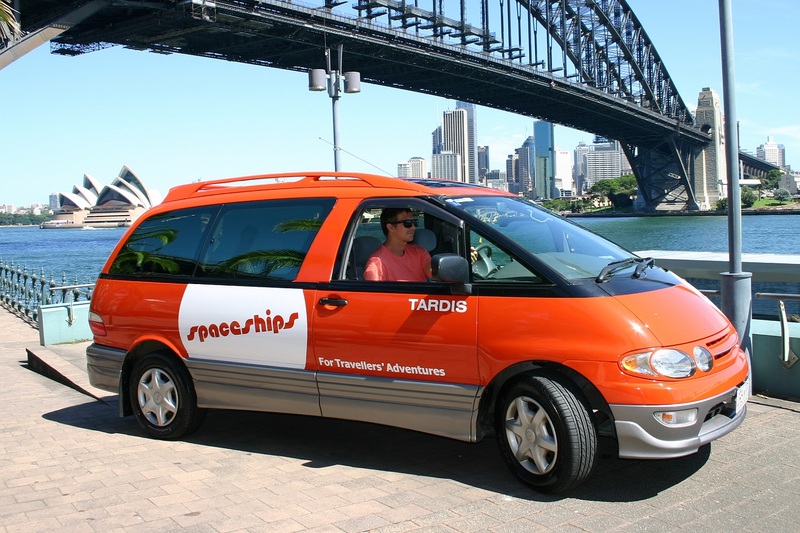 The Alpha Spaceship is like a good car to drive. They are well suited to Australian roads, hills and cities. Features include two cup holders, single slide door, electric windows, mirrors and power steering. 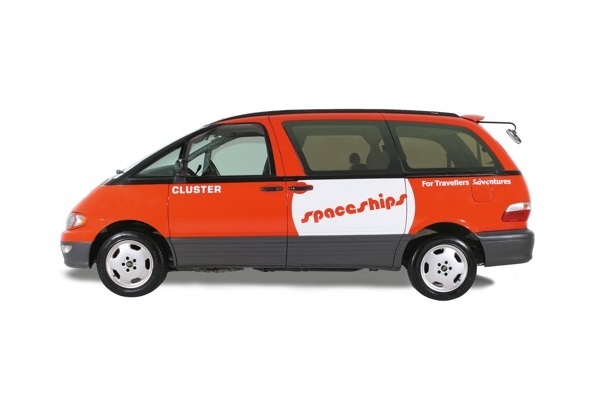 In keeping with all Spaceships they are fun, safe and easy to drive. 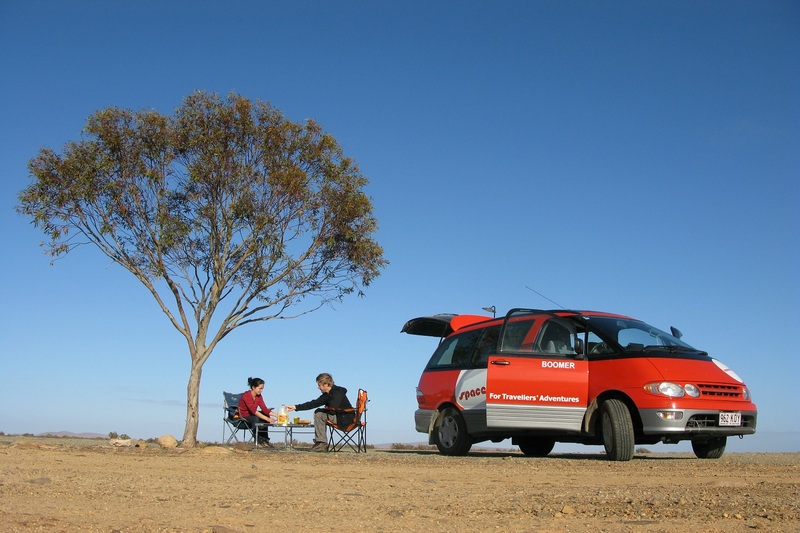 Please note: The shown motorhomes are only example vehicles of the different groups. Relevant for your booking is the vehicle data - number of seats and beds, layout - shown on the availability screen and on the reservation screen.